That evening we decided to go to the village of Mawang to see the performance of the Calonarang story - a glimpse of the dark side of the Balinese spirit world. It was pitch dark as we took the crammed minibus out to Mawang, and we arrived at a courtyard in front of their temple, lit only with flickering torches. We had seen a short excerpt from the Calonarang story in Peliatan when we first arrived, but this performance focused entirely on Calonarang - one of the most important stories in Balinese culture - which tells of witchcraft and black magic. 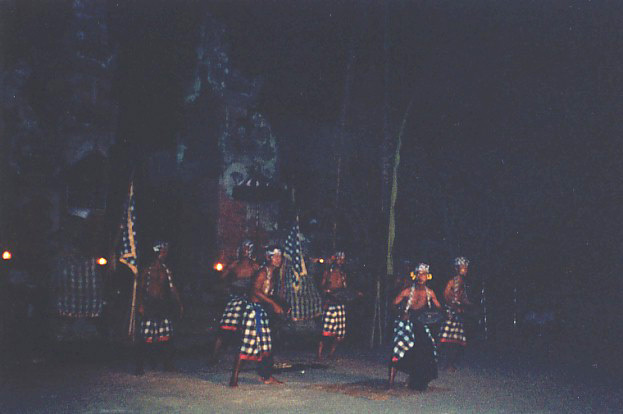 It seemed fitting that the performance took place at night in the dimly illuminated grounds of the temple - it gave the performance a spooky edge, although it made photography difficult. Much has been written about the Calonarang drama. Essentially it tells the story of the widow Matah Gde, powerful practitioner of black magic, whose daughter is betrothed to the son of King Erlangga. When King Erlangga is informed by his Prime Minister that his son's intended is in fact a witch, he calls off the wedding and dispatches the Prime Minister to break the news to Matah Gde. Upon receiving this news, the widow flies into an almost uncontrollable rage, and demands that the Prime Minister leave before she kills him. However, she instructs her apprentice, the witch Rarung, to follow him, and on his way back to the kingdom of Erlangga she attacks him and after a fierce battle in which she transforms herself into a bird, she plucks his eyes out. Upon arriving back at Erlangga, the Prime Minister's brother Pandung, enraged by this assault, begs permission to return to the kingdom of Dirah where the widow lives, to kill her. When Pandung reaches Dirah he finds the widow, now transformed into the monstrous Rangda Ning Dirah, or Calonarang. A fierce battle ensues, and Pandung slays Rangda, stabbing her with his sacred kriss. However, Randga is resurrected by the power of Durga, Queen of Witches and Goddess of Death, and at the end of the drama the witches all dance triumphantly. 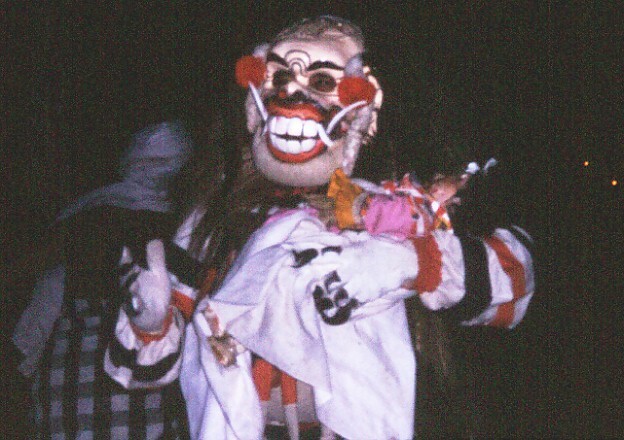 (For more information on the Calonarang drama, see Judy Slattum's excellent book "Masks of Bali" (Chronicle Books) which contains a detailed discussion of the subject). To the Balinese, this is a real and very scary story. Dewa, our driver, told us of how he had been petrified as a child when his parents would take him to performances of the Calonarang drama. This was pure evil personified - without TV's desensitizing plethora of bad guys and played-out dramatizations of good versus evil every night on the tube, pre-Westernization Balinese villagers (and many villagers still today) find this drama very real and powerful, and in many ways a reminder of the dangers of the dark spirit world that is all around them. 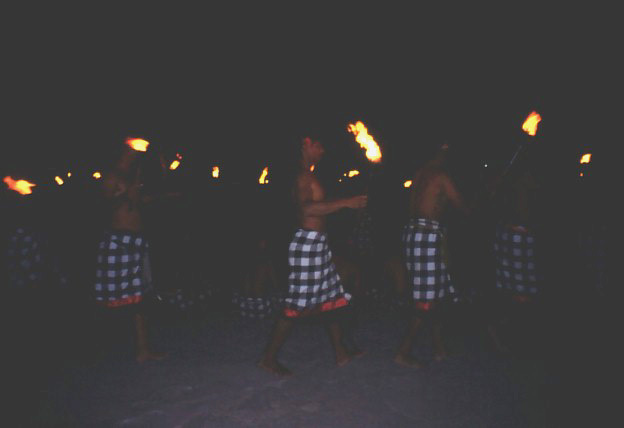 The villagers form a long procession with flaming torches, depicting the journey to the kingdom of Dirah where black magic reigns. The widow, now transformed into the fearsome and powerful witch Rangda, emerges from the darkness. The men who portray Rangda must be well-protected spiritually, as by donning the Rangda mask they are summoning dark forces that can be extremely dangerous if not kept in check through the dancer's own mantras and spiritual power. Only certain men in the community may play Rangda, and they must go through careful preparation before assuming the role. Rangda carries a white cloth, sometimes inscribed with powerful mantras, that can kill a man with one blow. She roars in an unworldly voice and in this performance throws balls of fire at her attackers. 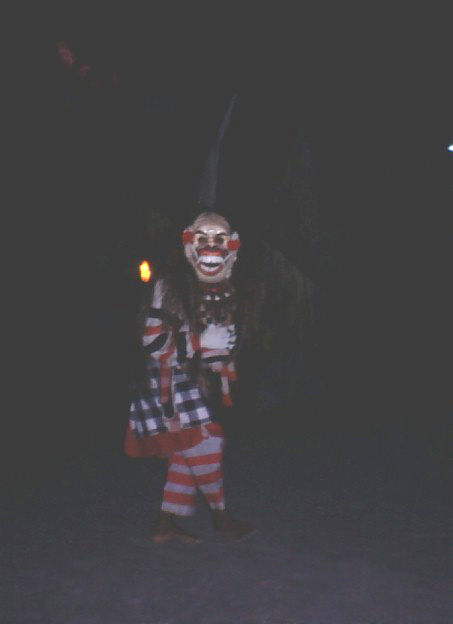 This performance, although put on by the local villagers and in some ways quite amateurish, was still quite chilling. At the end of the performance the crowd of gathered villagers, which, eerily, seemed to represent at the same time the villagers in the drama as well as the contemporary villagers of the villagers of Mawang, rushed into the temple to offer their prayers and receive their blessings and holy water. Another thought-provoking end to a long and eventful day.